On the heels (or, more precisely, the hallux) of the purple finch, comes another bird from the north, the pine siskin (Spinus pinus — a scientific name with some poetic potential). This species also arrives in Sewanee in waves that vary considerably in strength from year to year. Perhaps last week’s major snowstorm up north has pushed these birds south? 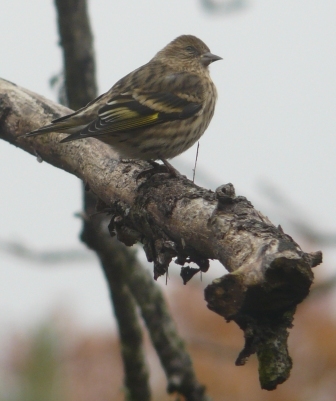 Pine siskin: characterized by a sharp little beak, plus yellow streaks in the wings and tail. This entry was posted in Archosaurs on November 4, 2011 by David George Haskell.